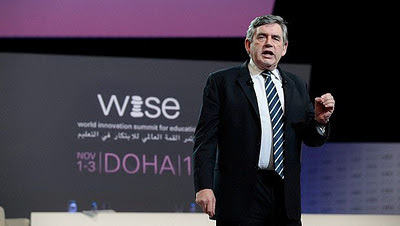 I slipped into a front row VIP seat for Gordon Brown’s talk at WISE in Doha, Qatar (security were clearly fooled by the Scottish name on my pass). I have to say he was on fire. No notes, just a brilliant analysis of global education and poverty that captivated the audience and gave the summit wings. This may be hard to believe but he seems to have been reborn. After an endless series of lacklustre educational panellists Brown’s speech had it all. Millennium goals for 2015 will not be met for another century; children been betrayed. It’s now impossible to meet the Millennium Development Goal to cut infant mortality by half, but, he claimed, the goal on education could be achieved if we have focus and will. His Reagan joke was a cracker. When A Swedish minister spoke on world poverty and education Reagan asked if he was a Communist. He was politely told by his ambassador that the Swedish minister was, in fact, an anti-Communist. “I don’t care what kind of communist he is” said Reagan, “he’s wrong”. The point was that politicians, companies and not-for-profits must all pull together on this one. One of Brown’s strengths as a politician is his principled approach to world poverty and when he tells stories of his visits to Africa and other countries in the developing world, they’re told with feeling. The evil o child labour where 300 million children working today when they should be at school. We heard of a child bride who died in childbirth, too young to bear her child, the woman who turned to prostitution to send her child to school, the child soldiers, a real evil, forced to commit atrocities. Killer facts, for example, a Sudanese girl stands more chance of dying in childbirth than receiving a school education. I spoke to several people afterwards who were truly moved by this part of the speech. I was. “We must hold national Governments to their promises to provide the funding both in development aid and of course the funding that individual developing countries’ governments have promised for education in their own areas,” he said. “And where countries fall behind, we should be telling them that this is not acceptable because it is not simply about them and their generation – it is about future generations, ”what was required, he added, “was a global fund for education in the same way there was one for health”. Heady stuff. Now listen to this, as at this point things got really interesting. He gave a detailed account of why online learning was essential to his vision. I was not surprised at this. Brown was the brains behind UFI, an e-learning charity I’ve been a Trustee on for over six years. Unlike Gove and co, he believes in this stuff. “I want all the technology companies, the Microsofts, the Apples, the Facebooks, the Googles to be involved in this project,” he said. He said he wanted technology to be available to the poorest countries. “If they have a worldwide vision, as we have, about the importance of education, then they should, as Sir Tim Berners-Lee, the inventor of the Internet has said, make it possible not for 20% of the world to benefit from the internet, but 100% to benefit from the new technologies, including the Web, that are available.” The only odd moment was mentioning Simon Cowell. Educational Idol here we come. This was the really fresh idea, that scalable technology will, is in the end, the only real global driver in terms of reducing cost and reach. Far too many of the educational leaders at the conference were closet luddites, who can’t see past the ‘we need more teachers argument’. They’re right but teachers are not scalable. It took a politician to show the word’s educators how to communicate, teach, frame a problem, provide facts and detail, THEN a solution. His speech was masterful, laying out the many dimensions of the problem, informing through humour, moving the audience with heart rending stories then he hit us with a vision, a clear goal and details on funding. All children in school by 2015, with massive injection of funds by the private sector, public sector, religious institutions and not-for-profits, all given wings by technology, mobiles and the web. Suddenly he’s naming Sartre, de Beauvoir and quotes Camus, "shouldn't we admit we got it wrong" and asks that we put it right. Education at that turning point, every child in 21st C should be at school. “When Cicero turned to the crowds in ancient Rome, people said, 'great speech'. When Demosthenes spoke to the crowds in ancient Greece and people turned to each other, they said: 'Let's march. Let's march for education and let's march for it together.” At last, a call to action. For me, this was the high point of the Summit. His standing ovation was deserved as he had stood up for the poor. Education is not an end in itself, it is a means to an end. He was mobbed as he left the stage and it was a shame that he didn’t stay to answer a few questions and speak to a few of the people from the developing world who had clearly been moved by his words. In fact he seemed uncomfortable in the melee and relieved to be rushed out of the side door. I spoke to Charles Clarke afterwards, but he missed the speech due to a misreading of the programme (they are arch enemies, Charles having attempted a coup in 2009) and agreed with Clarke’s point that the focus on primary schooling was wrong. What we need is focus on vocation education to tackle relevance and unemployment. At least these guys have the big picture and vision. I heard nothing like this from the educational establishment, many who seemed past their sell by date. But my real worry is whether his call for action is realistic. We’re in a recession and finding funds for a fresh push on a reframed Millennium Goal seems unlikely. The idea of a single fund is the only way to solve the problem and as Jan MorganKaufman pointed out view Elizabeth King, the Director of Education at the World Bank, we have a fund. Unfortunately it’s too small. However, I hope the golden wind will fill his sails, as it’s such a noble cause. Brown can say all he wants about education but bluntly put he FAILED as Chancellor and PM by wasting money on his pet projects (mostly to do with paying people to vote for him) and since then has hardly appeared in the Commons, a job he's being paid for. I'm sorry but his past history, bullying and hypocrisy mean I and many others can't/won't listen to him. Yesterday's failure and still trying to excuse his appalling stewardship of the UK. He had so many chances to do all he wants to do for education etc but didn't take them. Wonder how much he was paid for this talk? Thinly veiled 'anonymous' rant. If you don't want to 'listen' then don't bother commenting. What's your point? That he bribed people - risible. By the way he has been consistent in foreign aid, especially for education. Come on give us some ideas, not this playground politics. Still looking for the video recordings of the talks. But I have heard any number of people actually doing work in education who are as passionate and articulate as described here. But looking at the list of speakers http://www.wise-qatar.org/node/9578 it is evident that these people are not invited - instead, the conference is mostly about politicians and managers. So it is very likely that the Brown speech was the best of a bad lot. The last point you made about the drying up of money is going to be key as an argument for many people why now is not the right time, or why it will be turned by others to justify their own intention, rather than all working collaboratively. I had an interesting discussion with a fervent anti-capitalist a few days ago about education. His argument that stressing vocational needs puts too much weight on the big companies having control, rather than allowing the entrepreneur to grow. "Then again, yesterday's entrepreneur is tomorrow's capital pig?" was my response and cited a pet hate of his ... the late Mr Jobs. Sometimes I do think you can't win with some people ... but that shouldn't stop us trying. Goals are still to short term and too political. We can see that from the fact that the good aspects of Free Schools are politically tied to the bad aspects. They will be as derided as CTCs were in some sections, yet hailed by others. The idea that Education has to be outside of politics has some very good points, but that should not be confused with keeping politicians out of education. Too many politicians are ridiculed due to their party, rather than celebrated for their ideas, and it is sad that good ideas may be missed due to blinkered views on past activities. Then again ... as one friend said to me, stick a bunch of academics in a room to discuss differing research views and the blood which flows is equally as read as that on the senate floor. To be honest the most articulate, realistic and best communicators were the politicians. The next most interesting group were the innovative thinkers, writers and bloggers. The University administrators and profs were short on ideas. I agree with your observation - too many administrators, not enough thinkers. Politicians were fine - spoke to several - they get things done and can think strategically. It was the University administrators and others,let us say divorced from reality, who were next to useless, simply repeating platitudes from the past and denying the future. What was admirable were the people from the developing and Arab world. The Arab Spring was a huge debating point. Don, Stephen: Isn't this vision of going digital very simplistic? Especially when we know that the state of technology (infrastructure and awareness) is miserably low in the very locations that contribute the largest number of learners. I still remember the LTWF launch pre BETT before the last general election...the launch platform of Brown,Balls,Mandelson was ample proof of the last govt support for this issue. Sadly for Stephen Crowne and Becta it was probably the death knell as well! Do you know whether any of the speechs online? Nice and informative Blog regarding Supply Chain Management this is really helpful for people who interested in Online Education. Thanks and Keep Continue to share useful information with us.